Background Holistic, ubiquitous support of patient-centered health care (eHealth) at all health care institutions and in patients' homes through information processing is increasingly supplementing institution-centered care. 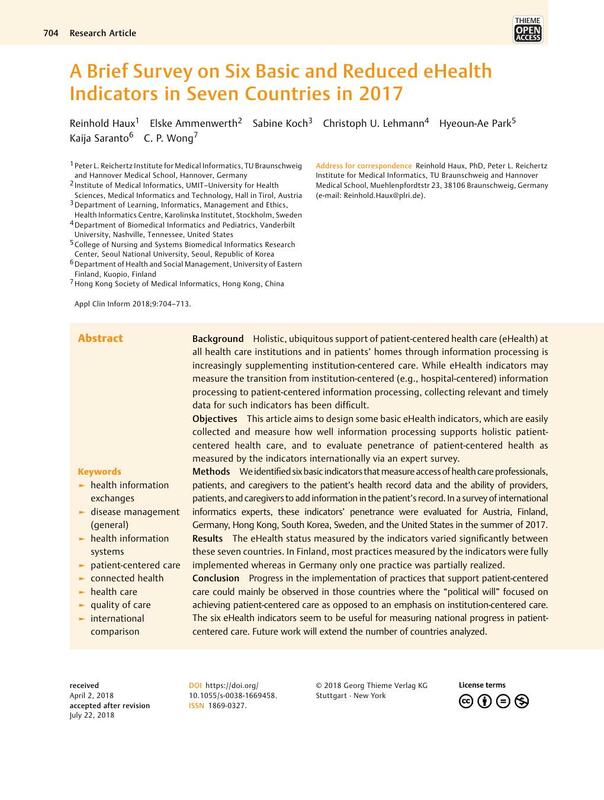 While eHealth indicators may measure the transition from institution-centered (e.g., hospital-centered) information processing to patient-centered information processing, collecting relevant and timely data for such indicators has been difficult. Objectives This article aims to design some basic eHealth indicators, which are easily collected and measure how well information processing supports holistic patient-centered health care, and to evaluate penetrance of patient-centered health as measured by the indicators internationally via an expert survey. Methods We identified six basic indicators that measure access of health care professionals, patients, and caregivers to the patient's health record data and the ability of providers, patients, and caregivers to add information in the patient's record. In a survey of international informatics experts, these indicators' penetrance were evaluated for Austria, Finland, Germany, Hong Kong, South Korea, Sweden, and the United States in the summer of 2017. Results The eHealth status measured by the indicators varied significantly between these seven countries. In Finland, most practices measured by the indicators were fully implemented whereas in Germany only one practice was partially realized. Conclusion Progress in the implementation of practices that support patient-centered care could mainly be observed in those countries where the “political will” focused on achieving patient-centered care as opposed to an emphasis on institution-centered care. The six eHealth indicators seem to be useful for measuring national progress in patient-centered care. Future work will extend the number of countries analyzed. Each author is responsible for the values of indicators for her or his respective country. R.H. led the overall organization of this article and designed the survey. The six basic indicators were the outcome of discussions of R.H. with all authors, in particular with E.A. and S.K., who also contributed to the references.